A new Huawei smartphone has been certified by Chinese certification and regulatory authority TENAA, revealing some of its key specs. 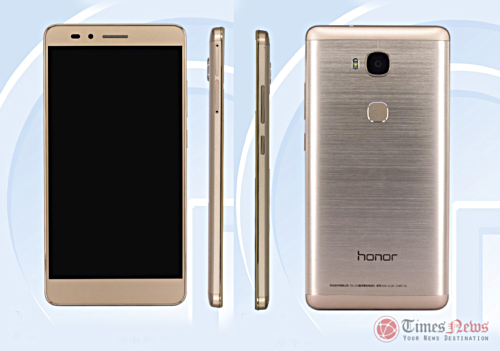 Listed as Honor KIW-AL20, the device is powered by an octa-core 1.5GHz CPU and sports a 5.5-inch (1920 × 1080 pixel resolution) TFT display. The handset has 3GB RAM and 32GB expandable internal memory. In terms of camera, the Honor KIW-AL20 features a 13MP rear unit and a 5MP front shooter. Measuring 151.3 × 76.3 × 8.15 mm and weighing in at 158g, the smartphone runs Android 5.1.1 Lollipop OS. The device, which seemingly features a metal build and also a fingerprint sensor, comes in three color options, including gold, grey, and silver.